Losing the Drivers’ Championship title to Lewis Hamilton, rumours surfaced after the Mexican Grand Prix claiming that rival teams are eyeing up the disgruntled Binotto. 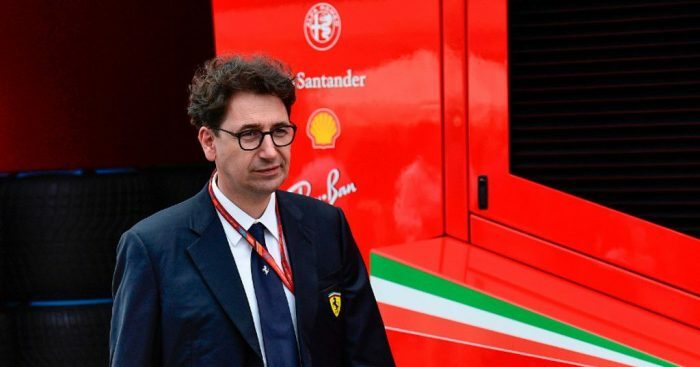 “Ferrari’s competitors have quickly reacted and Mercedes and Renault have asked questions of Mattia Binotto,” F1 journalist Luis Vasconcelos told the Finnish newspaper Turun Sanomat. Binotto’s Ferrari deal is believed to run out at the end of this year. However, team boss Maurizio Arrivabene insists the technical director is not going anywhere. “Let’s make it clear once and for all,” he told Autosport. “The rumours about Mattia are a fake news, put around to create instability in the team. “It is an attempt to try to create problems where there are no problems, and I do not want to comment on false rumours anymore. “During this season there have been many attempts at destabilisation, sometimes with stories about the drivers, others about the technicians. In fact rather than saying farewell to staff members, Arrivabene is talking about bringing in reinforcements but won’t be rushed into making any decisions. He added: “No one has ever spoken of goodbyes, possibly we can talk about reinforcements. “But it takes time, we’ll think about it next season. Today the team is there, and it’s a good and compact team. “If there are reinforcements they will arrive without any haste, I stress it, and [only] if we need to have them. “The line is that of stability, if there are additions [they] will not undermine the soundness of the existing group.